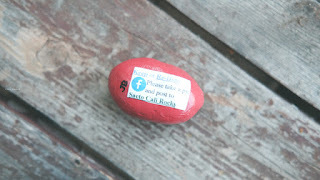 Have you seen rocks hidden around town and not sure how they got there? 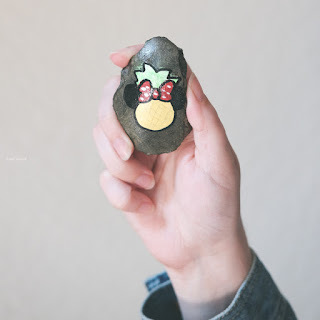 People across the USA (and even worldwide) are participating in a simple gesture of rock painting & rock hiding in hopes to bring a smile to someone else. If you were having a bad day and then all of a sudden saw a rock painted with a funny face wouldn't that brighten your day? 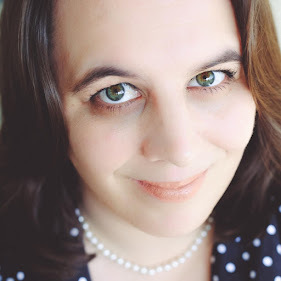 How did this movement get started? It all started with one woman who wrote some positive messages on rocks at the beach. She later found out from a friend who found a rock that it brightened her day and that is the moment the idea started. 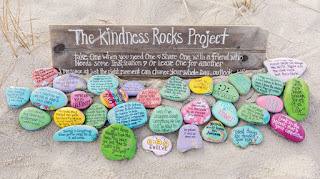 The Kindness Rocks Project and has spread like wildflowers with groups of people coming together to paint and hide rocks all over the globe. I heard about this movement several months back but never really thought much about it until recently. A friend of mine started to share her family photos of painting rocks and hiding them around town. I thought this was a brilliant idea and I wanted to start to paint my own rocks and hide them too. When doing research for this article I discovered my local group SactoCaliRocks was started by a family who enjoyed painting and hiding rocks together and wanted to involve others in the community to join in. It has been a little over a year and the group is growing everyday with new people joining the movement by spreading joy across the community. On the back of the rocks hidden by people in the community is a tag redirecting them to the group where they can learn more about the movement and share photos of the rock they found. Not only does the recipient receive a smile but it also brings joy to the artist who painted the rock knowing that this gesture brightened someone else day. Most of the artists do not sign their name to the rocks so that they can anonymously bring joy to others. What I love about this rock painting and hiding movement is that you can design the rocks how you like (as long as they are promoting kindness). You don't have to be a professional artist or a talented writer to create something beautiful. 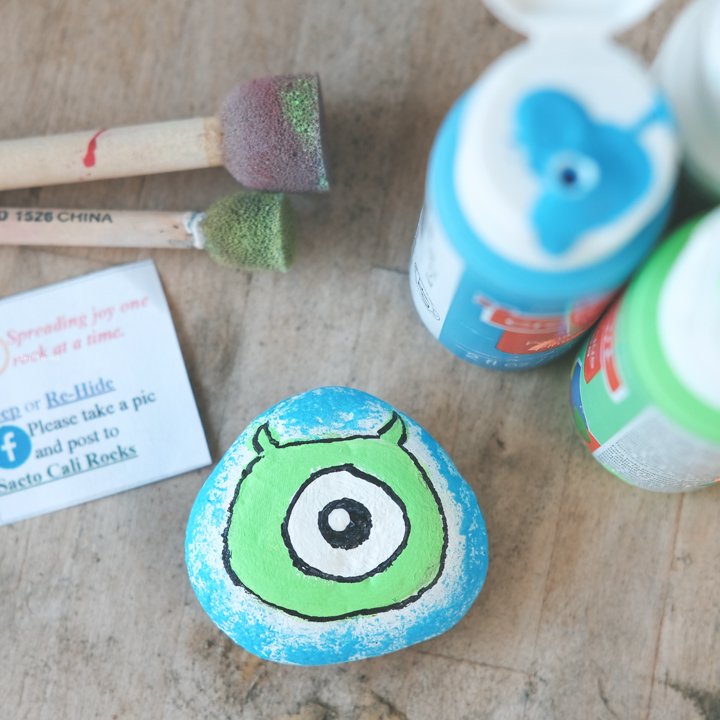 You can paint your rock as elaborate or as simple as you like. I don't have a way with words so I have decided to bring my love of Disney and other random characters to life on the rocks. 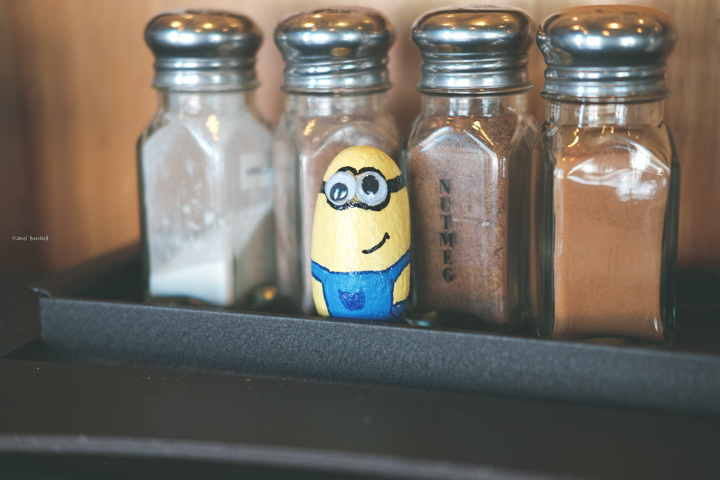 Everyone has a different way to create using various forms of medium. Some examples of art medium I have seen used is paint pens, sharpies, chalk and acrylic paint. Basically my thought is use what you have and then when you have some extra money go try a different art medium. After you create your masterpiece you want to be sure to seal the creation to protect it and keep your art lasting a long time! You never know how one simple gesture of kindness can change a persons day! More information on where to find or place a kindness rock please visit The Kindness Rocks Project website.